Grab your Punisher Shortsword and your Plasma Carbine and make your mark in the Mutant Chronicles! I still have yet to get this on the table, but it comes highly recommended as a worthy precursor to Doom and Heroquest so I picked up a copy on eBay. Sci-fi corporations duke it out on an alien world. 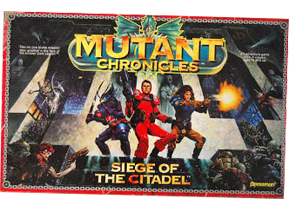 Just a note to let you know that the link for the Mutant Chronicles: Siege of the Citadel summary isn’t working. Thanks for the help as I really enjoy these. This is really great… Seeing all those “old but gold” games still receiving that attention! Thanks a lot… This rocks!! !